Wiggum: Lou, you're promoted to chief of police. Wiggum: And Eddie, you're promoted to Lou. Eddie: Nice. And, uh, who's gonna be Eddie? Wiggum: We don't need an Eddie. No matter what country you're from, if you are in the military, there will be a ranking system. Most of the time, military personnel are required to be in a certain rank for X amount of months or years before they are even allowed to be promoted. This justifies the reason why you don't often see military promotions in television or movies. But this trope is about when a character is promoted in show. During season one, you may have known him as a newly commissioned 2nd Lieutenant Bob, but by the third season he becomes known as Captain Bob. After this promotion expect the character, if he is not a protagonist, to go in one of two directions. Either his increase in responsibility makes him a more important character in the series, or his responsibility gives him less time to spend with his friends. The middle ground is rare. Compare Took a Level in Badass, except this character's badassness has a title. This is not simply a military trope. Law enforcement agencies are hierarchical and large companies have a ranking system also, but these promotions have little impact on the story, unless the character is striving for it (in which most of the time he never gets it). Not related to Level Up, where taking a level in badass includes numbers and stats, not titles and authority, although games whose characters are part of a military or paramilitary force may tie one to the other. Contrast this with Limited Advancement Opportunities. See also Field Promotion and You Are in Command Now. Compare Up Through the Ranks when a veteran enlisted man is made an officer. Attack on Titan: The remaining members of the 104th Trainee Corps after the Clash of the Titans arc are made into the Levi's new squad. In Naruto, almost all of the Konoha 12 ninja are promoted in between the Time Skip. Naruto himself averts this, being now possibly the most powerful ninja in the village but having one of the lowest ranks. Gaara, however, takes this further by going from Genin (the lowest rank you can have while still being considered an active ninja) to the Kazekage (essentially president of one of the five major nations of the world), and his siblings and Neji become Jonin. In One Piece, Captain Smoker gets promoted by the Marines to Commodore. Commodore Smoker is not too happy about his promotion as he feels he didn't deserve it, but he does use his new leverage to operate wherever he wants. After the Time Skip, he gets promoted to Vice-Admiral. This time it was by his own merits, seeing as he needed this rank to go chasing after the Straw Hats in the New World. Smoker is an interesting case in that he was an Almighty Janitor. While there is no doubt that he gained that promotion as a result of a cover-up, it can be easily argued that he should've gotten it sooner, by virtue of the fact that he was way stronger than the average captain or commodore already by that point. The only reason his rank wasn't higher when he first debuted was because his Cowboy Cop tendencies. Akainu is another example. In his first appearance, in Robin's flashback to 20 years ago, he's a Vice Admiral. When he first appears in the present, at the start of the War Arc, he's an Admiral. After the Time Skip, he's become the new Fleet Admiral. Lyrical Nanoha: Between seasons, the characters go up ranks. The Forwards start out with Subaru and Teana as Privates Second Class and Erio and Caro as Privates Third Class, but by StrikerS Sound Stage X, Erio and Caro are Privates First Class, Subaru is a Corporal, and Teana is an Enforcer with equivalent rank to a Second Lieutenant. By Magical Record Lyrical Nanoha Force, Subaru has been promoted again to Sergeant. In the same time period, Signum and Vita, Second Lieutenants, advance to Captain and First Lieutenant, respectively. Averted with Nanoha, who was offered multiple promotions at the end of StrikerS, but turned them all down. Rukia Kuchiki is promoted from a seatless soldier to lieutenant during the Time Skip. After the second time skip, she's promoted to captain. Turn Back the Pendulum begins with Urahara's promotion to captain of the 12th Division from third seat in the 2nd Division. In between TBTP and the main story, Byakuya, Sui-Feng, Mayuri, Aizen, Gin and Tousen all Rank Up to Captain from lower positions. The biggest Rank Up, by far, goes to Shunsui Kyoraku, who goes from Captain to Captain-Commander. After Everything but the Rain, Hitsugaya is promoted to captain from 3rd seat to replace Isshin Shiba. In Legend of Galactic Heroes, most of the main characters were promoted at least once by the time the series ended. An example would be Yang Wen-li, who started out as a Commodore in series 1 and reached the rank of Fleet Admiral by series 3. In Saint Seiya Episode GA Shun, Hyoga and Shiryu are now respectively the Virgo, Aquarius and Libra Gold Saints. In Fullmetal Alchemist, Mustang is seen as a Lieutenant Colonel in flashbacks when first meeting the Elric brothers, is a full Colonel for most of the story, and is mentioned to be a Brigadier General in the epilogue. Maes Hughes was also promoted to Brigadier General during the story — posthumously. At the end of Batman: Year One, Lt. James Gordon is promoted to Captain. By Year Two, he's become Commissioner Gordon. Stuart is promoted to district manager after Jerry leaves the company. This leads to him Commuting on a Bus, as now he has many stores to supervise instead of one. He proceeds to promote Marla to store manager (mainly so he doesn't look as misogynistic as Jerry). Marla has mixed feelings about that, as she had been planning to leave herself to start her own business, but she was also eight months pregnant at the time and needed the money. Later story arcs involve her despondency and everyone else's disappointment at her becoming 'the man'. "The longer I'm a manager at Grumbel's, the more I have to become part of a machine I don't like." When Marla finds out that she can have a stockroom supervisor, she promotes Cooper, who at first doesn't take the role seriously. He eventually starts rising up to the task out of loyalty to Marla. Taken Up to Eleven with Keith Sanzen, although this happened off-panel. In 2014, he was a supervisor for EGRGIS, the inventory service often featured in the strip. When he reappeared three years later, he somehow got promoted to senior vice-president. Along Came a Spider: Kai Allard-Liao is promoted several times through the Clan War. Bait and Switch: Lieutenant Commander Reshek Gaarra joins the USS Bajor's crew as operations officer because the ship's previous ops officer, Lieutenant Commander T'Var, was promoted and given her first command. "The Only Way to Go": Sobaru Lanstar is referred to as "Commander Lanstar" in this story, despite having been a lieutenant in Faces In The Flames, implying she was given a posthumous promotion. Rather than Kakashi or Danzo, Naruto is named Rokudaime Hokage. Unlike in canon, it's acknowledged to be a permanent post (Naruto is even named Supreme Leader of the Allied Shinobi Forces after the Kage Summit) — even after Tsunade wakes up, the only reason she retakes command of the village is because Naruto had to go in hiding for the first juncture of the war. They're basically sharing the title, and it's all but confirmed that Tsunade will formally retire and revert all of her duties to Naruto when the war is over. Throughout the story, those not personally acquainted with Naruto address him as the Hokage — including Edo Tensei Itachi. Even some of those who are address him as such in serious and formal situations. Right before the siege on Konoha, it's revealed that Naruto and Tsunade promoted Konohamaru to chunin, most likely in recognition of his amazing performance during the Invasion of Pein, where he managed to take out one of the Six Paths to save Ebisu. Several members of the Konoha 12 are promoted to jonin after their remarkable performance during the Gedo Mazo's attack. The Raikage himself hands them their new flak jackets. In Son of the Sannin, after the Chunin exams' finals, Naruto, Hinata, Sasuke and Tenten receive promotions to Chunin. Crimson And Emerald: Thanks to the positive publicity of taking down Stain and having better public relations, Hawks ascends to #2 in the hero rankings. While Endeavor is bumped down to #3. Anakin Skywalker rises through the Jedi ranks throughout Prequel Trilogy. He does resent the fact that the Council gives him a seat (at Palpatine's insistence), but doesn't grant him the rank of Master in Revenge of the Sith. In the novelization, he thought that getting the Council seat would give him the rank, then he could access the restricted records in the Jedi Archives that would show how he could use the Force to keep Padmé from dying in childbirth. Also Obi-Wan is noticeably sitting on the Council in Revenge of the Sith with his promotion never commented upon. Darth Vader is strangling Admiral Ozzel. Vader: You have failed me for the last time, Admiral. Captain Piett? Vader: [gives instructions] You are in command now, Admiral Piett. Vader: [after the Millennium Falcon "disappeared"] Don't fail me again, "Admiral". Meanwhile, Luke Skywalker has been promoted to Commander in the time between A New Hope and the beginning of The Empire Strikes Back. Captain Han Solo becomes General Han Solo, because he is just crazy enough to volunteer to lead the Rebel strike team to Endor's surface. As does his "friend," Lando Calrissian; he goes from Bespin City Administrator/Executive to General. In The Dark Knight, Jim Gordon ranks up to his comic book rank of commissioner. In the previous film, he starts off as a Sergeant and gets promoted to Lieutenant. Unfortunately he's still a Lieutenant at the start of Dark Knight, making this one hell of an overnight promotion to running the entire Gotham PD (mind you, candidates might be in short supply after the last one was murdered in his own office). Johnny Rico in the Starship Troopers film starts off as a private and gets promoted to squad leader, then sergeant, then lieutenant. The same for his ex-girlfriend, who goes from a lieutenant to a captain. James T. Kirk got promoted to rear admiral sometime prior to Star Trek: The Motion Picture. However, at the end of The Voyage Home Starfleet busted him back down to captain for stealing the Enterprise in defiance of orders in The Search for Spock. All of the series regulars moved up through the course of the movies - Spock, Scotty and Sulu all make Captain, while McCoy, Uhura and Chekov all make Commander. McCoy only moves up 1 rank from where he was in the series, though. Star Trek (2009) ends with the rather ridiculous promotion of James T. Kirk from third-year officer cadet straight to captain. This is handwaved as being because Nero and his crew apparently killed a lot of Starfleet's senior officers during the course of the movie. In the beginning of Star Trek: Generations, Worf, a lieutenant throughout the series, is promoted to lieutenant commander. Police Academy. Most of the main characters start off as cadets and graduate to officer for the second film. Any of the cadets from the original film still left are sergeants by the third film, justified by the fact that they are now instructors at the academy. Harris starts as a Lieutenant and becomes a captain upon his return in the fourth. Mauser is a Lieutenant in the second film, is promoted to captain midway through and is commandant of the rival academy in 3, while his Bumbling Sidekick, Proctor starts as a sergeant and is promoted to Mauser's Lieutenant vacancy when Mauser becomes a captain. Callahan starts as a sergeant and is promoted offscreen twice between films and Hightower is promoted to Lieutenant in the sixth film. The only recurring characters that don't see promotion are Commandant Lassard and Chief Hurst, though to be fair, there's nowhere for Hurst to be promoted to. Scheisskopf is constantly promoted. He begins as a Lieutenant, but by the end of the book, is a Lieutenant General in charge of the whole army. Yossarian gets promoted to Captain for one of his missions and is offered a promotion to Major if he tells everyone that the war is a good thing. The hero of Robert A. Heinlein's Time Enough for Love's story-within-the-story "The Man Who Was Too Lazy to Fail" got promoted over and over again while never actually doing anything. 1st Lieutenant Hassan, a field commissioned officer, chose to go through OCS and become an officer "properly", even though he would be demoted to 2nd Lieutenant after graduation (and that's assuming he passed). As a former ranker without formal education, his prospects for further promotion in a peacetime Army were non-existent, and not good even in war-time. Having gone through OCS and having prior combat command experience, he can pretty much write his own ticket. Colonel Nielsen, who chose to become the OCS Commandant instead of taking a medical discharge. Since he was a General and Commandant is a Colonel's billet, he took a demotion (though it's stated that he will be promoted back up when he retires). Happens lots in the Honor Harrington series, both to the main character (who has gone from a Commander to Admiral of the Fleet) and much of the cast—many characters from previous books reappear promoted. Those that survive, anyway. Elfangor's Prince promotion in The Andalite Chronicles probably also counts. And Visser Three's ascension through the ranks, to eventually Visser One by the end of the series. In Win, Lose or Die by John Gardner, James Bond is promoted from Commander to Captain when he has to return to active duty in the Royal Navy as part of an assignment. He keeps this rank for the remainder of Gardner's series. In the Discworld novel Guards! Guards! Carrot Ironfoundersson joins the watch as Lance-Constable Carrot, who is made a full Constable at the end. By the start of Men at Arms, Carrot has become a Corporal, and by the end he's Captain Carrot and his commanding officer Captain Vimes is made Commander Sir Samuel Vimes. Men At Arms also introduces Lance-Constables Detritus and Angua; Detritus becomes a Sergeant before Feet of Clay and Angua is Corporal by Jingo, Sergeant by The Fifth Elephant and a Captain by I Shall Wear Midnight. And Cheery Littlebottom is introduced in Feet of Clay as a Corporal (she gets extra rank for being an alchemist rather than a beat officer, as long as she doesn't try to give orders to real watchmen) and becomes a Sergeant (and accepted as a real watchman) by Thud! Sergeant Colon gets a temporary promotion to Captain in The Fifth Elephant owing to an absence of higher ranking officers. It doesn't go well. Apart from that, he and Corporal Nobbs are firmly settled into their positions. Over the course of the Phryne Fisher novels, Hugh Collins is promoted from constable to sergeant. Over the course of the John Appleby novels by Michael Innes, he goes from Detective Inspector to Commissioner of the Metropolitan Police. Kaladin hops from the First Oath to the Second in The Way of Kings, and then to the Third in Words of Radiance. The latter comes with a sweet Morph Weapon as a bonus. Shallan is already after her First Oath in the beginning of The Way of Kings, and goes two Oaths up during the course of the book, then goes another Oath up by the end of Words of Radiance. It's implied that she swore most—if not all—of her Oaths as a child, before she was forced to kill her mother, but the trauma caused her to backslide and forget she even had her powers. Dalinar goes from the First to the Second Oath in Words of Radiance. Lift goes from the First Oath to the Second in Words of Radiance, and then to Third in Edgedancer. In Cactus Canyon, there are five ranks that the player can get (Stranger, Partner, Deputy, Sheriff, and Marshall), with increases coming either from winning Gun Fights or random awards. Dark Heresy uses a system of ranks to represent the characters "leveling up" to a certain extent. In the second edition of Dungeons & Dragons, leveling up past a certain level as a Druid was rigidly tied to the character's position in the druidic hierarchy, meaning that she could not gain a new level until she was promoted to the next rank (which often required vacating the corresponding position first). Parker is promoted twice during the single-player campaign: off-screen between the mid-story flashbacks and the beginning of the campaign (from Second to First Lieutenant) and after Bannon's death (to Captain). Also, online matches promote you. Each online player gets a Rank Up after they have scored enough points in online matches, though officer ranks additionally have the "be in the top X% of the global ladder" requirements. While fancy insignia are largely just a Cosmetic Award, online players are much more inclined to follow a star-rank player's lead. The entire Wardog Squadron in Ace Combat 5: The Unsung War is promoted from Lieutenants to Captains following their mission in the Razgriz Straights. Also, Chopper is posthumously further promoted to Lieutenant Colonel. The Red Baron series has a rank system incorporated into its Campaign Mode. By default, you start out on the lowest tier of your chosen air service, and your missions are assigned for you. As you successfully complete missions and receive promotions, you receive more opportunities to lead flights and choose missions for yourself. Between Mass Effect and Mass Effect 3, Ashley is promoted from Gunnery Chief (somewhere between OR-7 and OR-9) to Lieutenant-Commander (OF-3), while Kaidan Alenko goes from Staff Lieutenant (OF-2) to Major (counter-intuitively, OF-5), technically outranking his CO, Commander Shepard, who remains at OF-3 throughout the trilogy. Captain Anderson becomes an Admiral by the third game and commander of all Alliance forces remaining on Reaper-occupied Earth, and while Admiral Hackett remained an Admiral, he went from commanding the Fifth Fleet to commanding all Alliance Forces by the third game, and eventually became the de facto leader of the Systems Alliance, as well as the commander of the combined military might of most of the Galaxy by the end. If you have the Spacer background, Shepard's mother Hannah is mentioned serving as an executive officer aboard another ship, then finally getting fast-tracked to Rear Admiral during 3 after turning down promotions during 2. Between his/her death from the Collector attack and the work with Cerberus and events of "Arrival" during Mass Effect 2, there really just wasn't any time to put Shepard through any proper promotions, and with the character's Spectre status, it's possibly a moot point anyway. But really everyone does what you say because you're Shepard and are very possibly the only thing standing between civlisation and oblivion. Terran units in StarCraft II get promoted based on the number of kills they make. An in-universe example is Artanis, who becomes the leader of the Protoss after Brood War. In the Stonetalon Mountains questline for the Horde, the player rises through the ranks of Overlord Krom'gar's army, becoming a general by the end. At the end, Garrosh kills Krom'gar for his war crimes and tells the player that his or her rank in Krom'gar's army no longer has any meaning. In the Vashj'ir zone of Cataclysm, players fight alongside an officer of their faction- Taylor for the Alliance and Nazgrim for the Horde. In Mists of Pandaria, that NPC receives a promotion; from Captain to Admiral for Taylor, and from Legionnaire to General for Nazgrim (he had previously been promoted from Sergeant in Wrath of the Lich King), and the player meets them in the Jade Forest storyline. Gryan Stoutmantle of Westfall. In classic World of Warcraft he was the head of a local militia. In Wrath of the Lich King, he appears in Grizzly Hills as a proper Captain in the military. Come Cataclysm, he has returned to Westfall and is now a Marshal. Colonel Troteman, from Redridge Mountains and the Burning Steppes, is now a Marshal in Pandaria. In the Soviet campaign in Command & Conquer: Red Alert, the player Non-Entity General starts out as a Lieutenant and gets promoted all the way up to General with Kane making him Chairman after Stalin is assassinated. Kukov starts out as a Captain and is later promoted to General also. Averted in the Allied campaign, where the player character is a Commander for the duration of the war. In a similar vein, the Soviet player in Command & Conquer: Red Alert 3 goes from Commander to General to Premier thanks to vacancies in the rank structure. XCOM: Enemy Unknown ties the soldiers' ranks to their Character Level: all recruits start at the Rookie rank/level 1, and progress through Squaddie (2), Corporal (3), Sergeant (4), Lieutenant (5), Captain (6), Major (7), to Colonel (8), gaining a new skill with every rank/level up. The original series had a different rank system: Rookie, Squaddie, Sergeant, Captain, Colonel and Commander. Rookies are automatically promoted to Squaddies after their first combat kill but the rest of the ranks are dependent on the global number of Squaddies you have: 1 Sergeant per 5 Squaddies, 1 Captain per 11 Squaddies, 1 Colonel per 23 Squaddies and a single Commander once the player has least 30 Squaddies. Promotions happen automatically whenever there's an opening, with the maximum number of officers capped at 50 Sergeants, 22 Captains, 10 Colonels and a single Commander. The primary reason for taking an officer into combat isn't their combat experience but because their mere presence on the battlefield decreases morale loss in the team from injuries and casualties - but if the officer is the one who bites it, the entire team loses more morale than they normally would. Star Trek Online similarly ties character rank to Character Level. Depending on whether you're in Starfleet, the Romulan Republic, or the Klingon Defense Force, the player starts at level 1 as a cadetnote ensign prior to season 8 or lieutenant and works their way up to fleet admiral/Dahar Master at level 60 (actual promotions for KDF tops out at General at 55, equivalent to Starfleet and Republic Militia Admiral — Dahar Master is an honorary and highly prestigious title). Your bridge officers can similarly be promoted from ensign up through commander/subcommander. In Uncharted Waters and Uncharted Waters: New Horizons, in addition to leveling up, your character can rise from being a commoner to becoming a duke. In one ending of the first game, you become King of Portugal. Treasure Planet: Battle at Procyon: Jim Hawkins is promoted several times throughout the course of the Tutorial and the Campaign. Jim Hawkins starts the campaign as an Ensign and is later promoted to Lieutenant, Captain, and finally Commodore. In Final Fantasy VIII, there is the SeeD rank, which you gain early in the game upon your main playable characters' acceptance into SeeD following the entrance exam. There are ranks 1-30 and Rank A. Your starting rank can be anywhere from 1-10 based on your initial performance in the entrance exam, though you have to really screw around to get a 1, and similarly you have to really go out of your way to perform well to earn a 10 starting out. Afterwards, there are a number of events throughout the game which can raise or lower your rank, though the easiest way (and easiest to exploit way) is to take a series of yes/no quizzes accessible from the menu, each of which raises your rank by 1. However, once you reach Rank A, your rank will always drop back to thirty if you don't kill at least ten enemies before your next rank payment. In any case, your SeeD rank has no affect on actual gameplay, only on a recurring payment of the game's currency of gil. The main story and gameplay of Atelier Lydie & Suelle: The Alchemists and the Mysterious Paintings is based around the Atelier Ranking System, which is established in the kingdom of Merveille in order to encourage the rise of alchemy within the kingdom. (And secretly in order to train up alchemists to defeat a monster which is threatening the kingdom.) 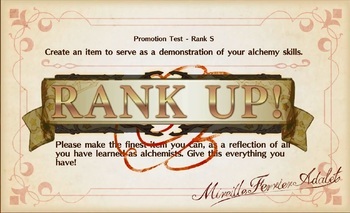 Throughout the game, the player's role is to control the two main alchemist characters, Lydie and Suelle, as they complete objectives and tests to advance in this ranking system with the goal of becoming the best atelier in the kingdom. You start at Rank G and the final task of the game is to take the test for Rank S. Completing it locks you into the game's ending. Old agent: Well done, Slick. Young informer: "Slick"? What happened to "Sport"? Old agent: You just got graduated to Slick. Kaff Tagon has a tendency to hand out promotions whenever anyone does anything impressive, which would probably violate military regulations if not for the fact that he owns the mercenary company and is bad about paying attention to procedure. He promotes Kevyn from civilian to munitions commander "on suspicion of supreme competence," promotes Schlock from grunt to corporal when he semi-accidentally saves the day, and promotes Pi to lieutenant when he saves everyone by detonating an infected A.I. (which didn't actually happen, but wasn't particularly out of character for Pi). Pi: But I almost blew up the ship! Kaff Tagon: Officers can get away with that kind of behavior, lieutenant. Kevyn, in the midst of apologizing to his girlfriend, realizes that since he sent her to take over an enemy ship, that means that she's technically a captain now — the same rank as himself, which means most of the things he was apologizing for are moot. She still appreciates the apology, though. Kevyn: Ennesby, if Commander Foxworthy commands the prize crew on a ship she captured, then wouldn't that make her Captain Foxworthy? Elf: [tearing up] Apology accepted. Kaff's father Karl eventually promotes Liz from galley chef to lieutenant, after finally realizing that her organizational skills are better put to use elsewhere. Commodore Tagon: Your promotion is effective immediately, which means we have a new problem. Liz: Nick already knows how to make all the foods you like. Commodore Tagon: Solved! You're going to be good at this. Stand Still, Stay Silent: There is a small ranking system for cats, depending on how useful they are as an Evil-Detecting Cat. Ordinary cats are Grade C, but can gain Grade B with some rudimentary training if they are under five years old. Grade A is reserved for specially bred and trained cats. Since the cat found by the crew during Adventure I is still a kitten, she gets training for Grade B in early Adventure II. Played for Laughs with this bash.org entry. During To Boldly Flee: Phelous gradually takes more and more power and gives himself increasingly absurd titles. Eventually MarzGurl awards him the title of "Jesus". When Homer becomes a missionary and goes to a Pacific island, he promotes Bart to Man of the House, Lisa to Boy, and Maggie to Brainy Girl. "The toaster can fill in for Maggie." Marge, however, is a consultant. As noted in the page quote, when police Chief Clancy Wiggum is promoted to commissioner, he promotes Lou to police chief, and Eddie to Lou. Parodied when Wiggum tells Lou that he'll promote him to Sergeant. Lou notes that he already is a Sergeant. Wiggum tells him to shut up or he'll bust him down to Sergeant. Spoofed on The Penguins of Madagascar, when Private is promoted to private first class. "Of course, we'll still call you Private. First Class is implied." During the American Civil War, Elisha Hunt Rhodes went from private to colonel. Frank Bourne joined the British Army as a private in 1872, aged 18. By the time four years had passed he had been promoted four times, was the youngest colour sergeant in the British Army, and was therefore nicknamed "the Kid". He was instrumental in the British victory at Rorke's Drift in 1879, won the DCM, and refused a commission because he couldn't afford to be an officer. He accepted a commissioned in 1890, and eventually retired in 1918 as a lieutenant-colonel. In the movie Zulu he was portrayed by an actor forty years old: the real Colour Sergeant Bourne was only 24 years old and 5'6" tall. During World War I and the Russian Civil War, the Czech adventurer Radola Gaida got promoted from a civilian pharmacist to general of the Czech army. During World War II, Carwood Lipton enlisted in the U.S. Army as a paratrooper and was deployed to Europe with the "Easy Company" (chronicled in the Band of Brothers miniseries). While overseas, he rose to the rank of First Sergeant (senior non-commissioned officer for the whole company) and received a Field Promotion to Second Lieutenant.